Heather Francis is originally from Nova Scotia, Canada. For over a decade she has travelled the world living and working on boats. In 2008 she and her Aussie partner Steve bought Kate, a Newport 41′ sloop, and have been sailing full-time since. They are currently looking for wind in in the Philippines and plan to do a lap around the planet, albeit slowly. During her adventures of sailing around the world, she managed to become the queen of provisioning. 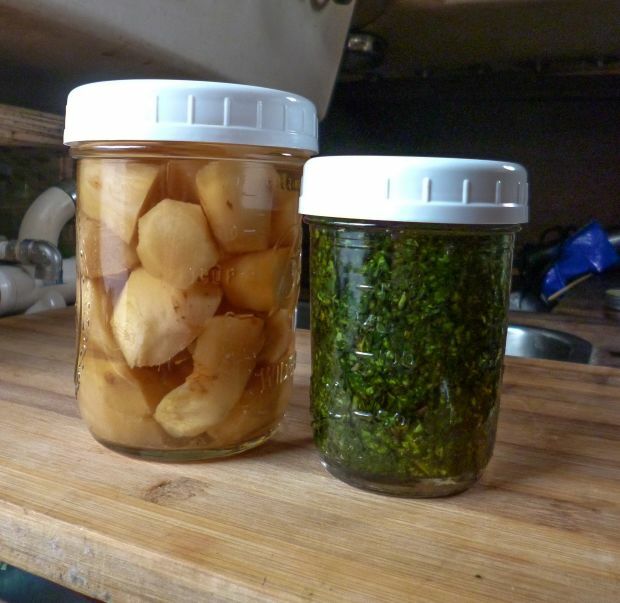 In this blog, Heather shares her experiences on how to preserve fresh herbs and veggies. Read her 5 insider hacks for fresh food onboard here. We shop almost exclusively local markets for our fresh produce and when an item is in season, it is usually inexpensive. However, with limited refrigeration on board our Newport 41′, Kate, I have had to come up with ways to use and preserve the glut of fresh goods I come home with. When I want to make my market swag last a little longer, I turn to my quick preserve recipes. 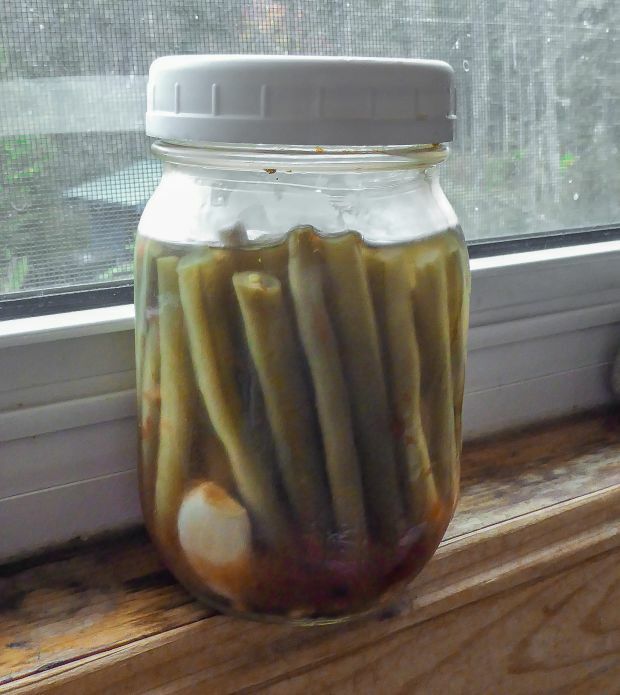 Pickled beans are deceptively easy but delicious. They are a terrific addition to salads, light lunches or cocktail hour charcuterie on board. 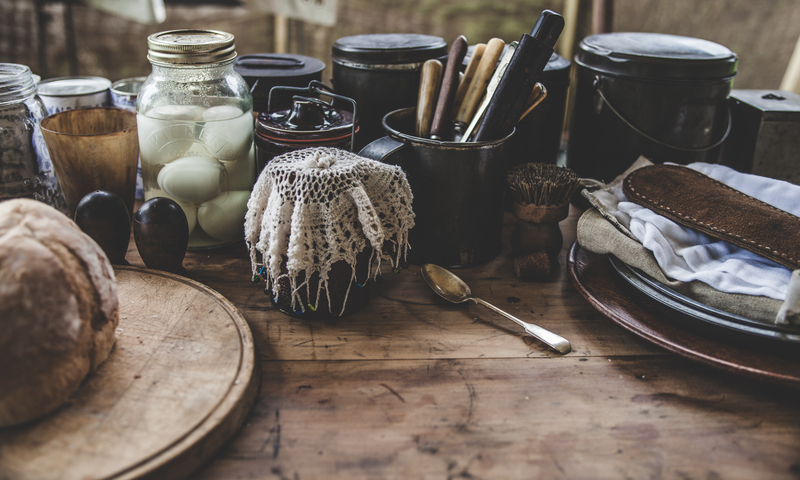 If you think making preserves is beyond your cooking skills this is a great place to start. Simply wash and cut the beans and pack them into a clean jar. Add desired herbs and spices and heat a simple vinegar brine. Pour the hot brine over the beans and pop on a lid. When the jar is cool put it in the fridge. The classic taste combination for pickled beans is dill and garlic but I like to add some chillies to give it a bit of zing. Not only are pickled beans a popular preserve they are also a classic, so you’ll have no problems finding several recipe variations and full instructions online. Aromatic herbs like basil are often too delicate to be crammed into a small boat fridge and they don’t last on the counter, even in a glass of water. So how can you make herbs like basil easy to store and last a long time? Marry it with another Italian favourite: olive oil. All you need to do is finely chop basil, pack it into a clean jar and pour enough olive oil to completely cover the basil. You should be generous with the oil as it creates a barrier between the basil and the air, which causes it to spoil, so float at least 5mm of oil on top of the basil. Pop on a lid and put it in the fridge. To use just spoon it out and add an instant pick-me-up to any pasta sauce. Top up with oil after use to prevent spoilage and you should get 3-4 weeks out of your basil. Ginger is a great spice to keep on a boat as it helps to relieve seasickness, not to mention is a key ingredient to make stir-fry. Although heartier than the leafy green herbs it still loses its punch as it ages. To keep your ginger firm and fresh you just break out the booze. Peel fresh ginger, cut into 1″ pieces, pack into a clean container and cover generously with your favourite spirit, I prefer rum but vodka works too. The alcohol preserves the ginger and will dissipate while cooking. There is no need to refrigerate this preserve, in fact, the ginger will stay fresh up to 6 months if it is submerged. BONUS: you’ll end up with a jar of delicious ginger-infused rum, perfect for a sunset Rum Punch! I love spicy food and nothing beats cooking with fresh chillies. To keep my chillies bright and crisp I employ the same preserving method as I use for ginger but I use vinegar instead of alcohol. My favourite types of chilli to use are the small Bird’s Eye or Thai chillies that are grown throughout the world. With this type of chilli, a little goes along the way, so you only need a small jar for this preserve. It is important to make sure that your chillies are clean, dry, and are free of blemishes. Then it is as easy as packing them into a jar and covering them with vinegar. No need to be fancy, just white vinegar will do fine. Like the ginger, the chillies will also infuse into the vinegar, which adds a lovely kick to salad dressings. Just remember when handling chillies to be surer to wash your hands before you touch anything else, especially your eyes! 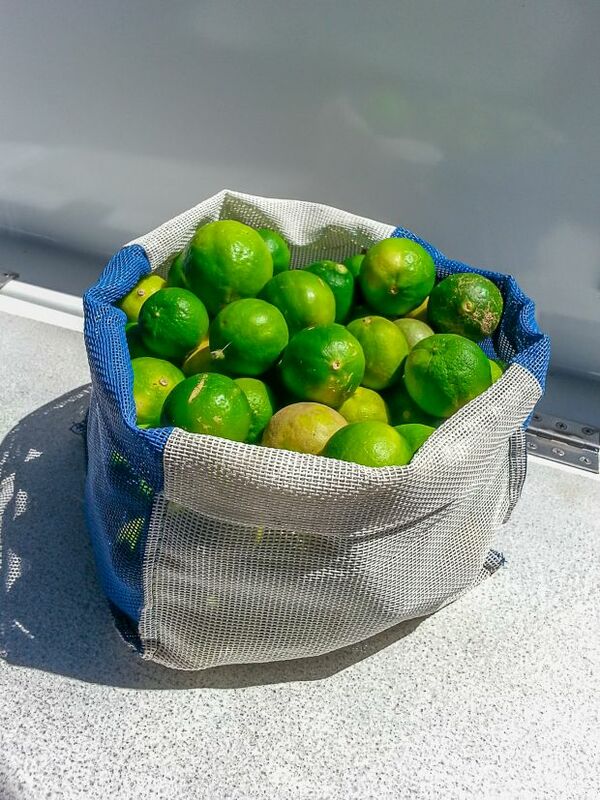 Ubiquitous to the tropics are limes, and we often have a basket, or two, in the cockpit waiting to be used. Although citrus fruit will last a very long time I like to use them up before they start to lose their colour. And the easiest way I found to use several limes at once is to juice them. A citrus press makes the juicing job a whole lot quicker but just squeezing them by hand or with the help of a fork sure does give you a good arm workout. I strain the juice into a large glass or plastic container, add a spoon full of honey and dilute with water by up to 50%. Stored in the fridge this semi-sweet lime juice will last about a week. It can be added to cool water to make a refreshing drink while out in the sun, or to hot water for a soothing mug in the evening. It also makes a great base for cocktails. When the market is overflowing with produce you can invest a little time in the galley and enjoy that bounty for weeks to come. Simple, quick and guaranteed delicious you can even get the kids in the galley to help with these quick preserving ideas. To follow the adventures of Heather and Steve on Kate, log on to www.yachtkate.com. Cooking on board can be fun, tasty, healthy and quick! It’s safe to say that at sea, there is no need to worry about having fresh food onboard. Would you like to try out a sailing adventure of your own? Make sure to contact our holiday planners and they will be glad to find the perfect boat for your next vacation.